In response to the increasing interest in raising locally grown food and gardening, and sensitive to the continuing beautification of the Sandyvale site, the Sandyvale Memorial Gardens and Conservancy has established 16 raised gardening beds surrounded by 30 assorted raspberry bushes and blueberry shrubs to assist neighborhood communities wishing to start community food gardens. 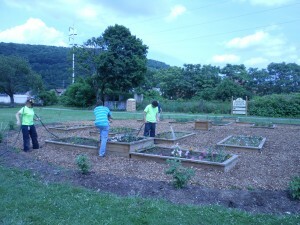 Sandyvale Memorial Gardens and Conservancy as host of the largest community garden in Johnstown, is currently seeking organized community groups that are looking to start sustainable and productive community food gardens in Johnstown. For more information on fees, guidelines, or for an application for a community garden bed at Sandyvale please contact dmkdaylily@atlanticbb.net .